I'm writing an othello game, working on the algorithms and the GUI in separate projects, and eventually will merge them together. Please test in windows XP/VISTA/7/8 and report any wierd or abnormal behavior you notice, any remark you have. A screenshot will be great if possible. The exe is clean, no virus inside, just an empty gui. But IMHO more than 40K for this interface is pretty big. You definitely need to optimize the size of the images. True color for 16x16 icons is excessive. You have only 284 colors in the active toolbar and 138 in the disabled toolbar. The icon also need to be optimized. On these simple optimizations you can spare at least 20k. @JohnFound i did a quick optimize and saved immediately 1/3 of it's size. Nice tip. I haven't given much attention yet in size. ^^Thanks for the response Enko. I verified that it works good in Linux under Wine emulator. The GUI looks classy due to the style of the icons harmonized with the dark green and olive green colors of the game board. 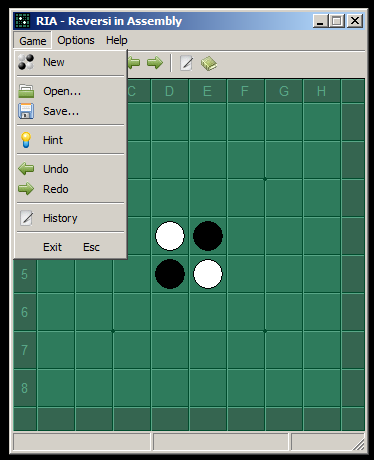 Works perfectly in Windows 7 64-bit with one observable side effect during the resizing: the main game board and the right and down margins are separated by thick black "gaps" unless we don't release the left mouse button. After that the thick lines disappear. ^^Thanks for the resposne MHajduk, i tried a lot of different icons. Now the gap it's supposed to do that, for now, the reason is that i'm doing a size fix in WM_EXITSIZEMOVE event. is that you draw those grids, circles in WM_PAINT event? hi sleepsleep, i use simple back buffer technique, drawing everything in memory and bitblt on screen in WM_PAINT event. Which format do you store graphics in? If BMP, you could probably save quite a lot by converting to GIF - which is loadable even on relatively ancient Windows versions if you do so by OleLoadPicture (iirc for loading from resources, this includes a bit of faffing about with IID_IPicture and CreateStreamOnHGlobal - but it's not too bad, and it gives you GIF decoding for free). hi f0dder, the images yes are in BMP format. I note your remark, i think i have used OleLoadPicture again in Visual Basic. Now i'm using image list functions for toolbar and menu icons. 1. Uses image lists, created from .gif images. For example the main toolbar contains 38 icons 16x16 in 1800bytes .gif image. 2. Disabled icons are created on the fly by the active one. 3. The whole library - gif decoder and disabled icons creator is 1616 bytes. 4. Total - maybe over 100 icons 16x16, 8 windows icons (not compressed) and 3 cursors - in 13kB resource section.